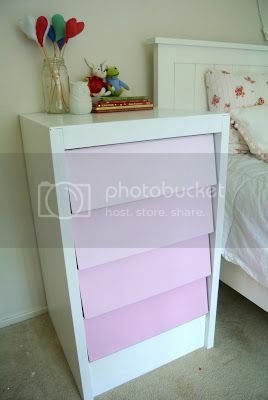 After posting about my daughters ombre drawers I had such a great response, and so many offers to buy them, that I knew I wanted try it out again when I found the right set of drawers. 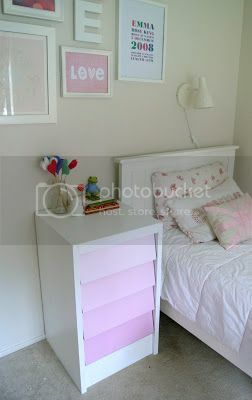 It seems to be such a great way to inject colour into a bedroom, and great for a little girls room who is dying to having everything pink! So when I found this set I thought they'd be perfect! 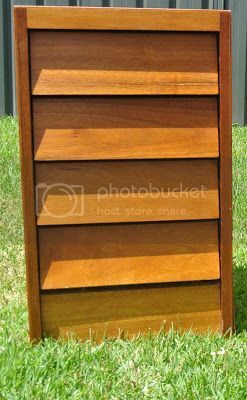 They are a great size, particularly if you're working with a small bedroom, and could even be used as a bedside table. I went very pale with this set; I find pink can be over powering (even though my little girl would love it), and since the set is smaller I decided to go with it. I already had the pink for the bottom drawer and worked up from there. I found it SO hard today to get good pictures, but there is a gradient there I promise!! If you're thinking about trying out ombre for yourself, it really is easier than I thought. I poured my pink paint into a plastic container for each drawer, so four in my case (I always keep the chinese takeaway containers or anything similar for just this purpose). For me it was then just a matter of pouring white in until I got the shade I wanted. I set them all up next to each other so I could see the graduating colour and make sure that nothing was too similar. so pretty....an amazing job you have done on these draws. oh i love how these turned out! the masculine shape paired with the sweet feminine colors is a wonderful marriage! love! 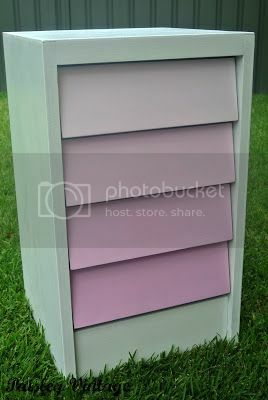 They look lovely, I have been meaning to do some ombre drawers!